Streamline your Christmas tree lot with these 4 color tree tags. There are 2 pieces so you can uses them for price and specials. As an added bonus, they have tree care tips on back! Tree tags are weather resistant for use in all weather conditions. These signs are made from long lasting plastic with a tough vinyl lettering. Useful for Christmas tree lot signs and tree sales. 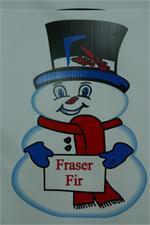 They are 24''x18'' and come in a variety of advertising designs. Tyvex two part tree tags. Used in retail tree lots to keep track of holiday tree inventory and tree lot supplies.